It is finally soup weather here in California. Not to be confused with “soup-y” weather, which refers to the hot, humid weather where you feel like you are literally walking through a bowl of soup, I’m looking at you East Coast. Back to my point, it is now officially cold enough to warrant having soup for 2+ meals day. By cold enough, I mean that the weather has stayed below 65/70 F for enough days to warrant boots and sweaters. Anyways, I would honestly have soup for all three meals a day. The only thing stopping me from having soup 3 meals a day last winter was not knowing any good breakfast soups, but now that I have miso soup down and its ingredients always stocked, I may never eat solid meals ever again. I was walking through the farmers market one morning, admiring the dozens of stands overflowing with various gourds and squashes, when I passed by a stand selling a bag of chopped pumpkin for $1. ONE DOLLAR. My mind did three back flips in a row while my body instantly gravitated towards the booth. One dollar for the perfect portion (around 1/4 of a whole pumpkin) of PRE-CUT pumpkin?! The only reason I had yet to buy a pumpkin/squash this season was because they are too large and too hard to cut to be worth the effort. Needless to say, life couldn’t have gotten much better than this. I immediately knew I wanted to make soup with the pumpkin, so I texted my mom while I was at the farmers market asking if she was using our immersion blender and if she would be willing to mail it to me. My mom knows me well enough to understand my crazy, and I like to think she supports it (? ), so she agreed to send it right away. Unfortunately, in the pumpkin frenzy, texting, and my general excitement, I forgot to check which type of pumpkin I bought. Big oops. This recipe, however, is very flexible, so any type of pumpkin or squash will work. I would recommend buying a ‘winter squash’, which I think this was, sugar pumpkin, or kabocha (japanese squash). Butternut squash can also be substituted here, but it has a very strong, identifiable flavor that would separate this from the classic “pumpkin soup” into a distinct butternut squash soup. Delicious either way. Also disclaimer: I use the words pumpkin and squash interchangeably, but it always refers to whatever gourd you are using in the recipe. This was kind of a left-over/ use-whatever-ingredients-I-have-on-hand recipe. I had half of a sweet potato and some baby carrots left over. I read somewhere that the carrots can be used to add color to the soup and figured that the sweet potatoes would add creaminess as well as extra color, so I added them all to the broth as well. Onions and garlic are essential bases to most soups, but since I didn’t have garlic on hand, I decided to caramelize the onions with the spices to add more depth of flavor. Obviously caramelized onions do not even remotely resemble the taste of garlic, but they added enough flavor and complexity that I didn’t miss the garlic in the finished product. Also, I bought half&half specifically for this recipe, thinking the soup would need a little cream to finish it off, but I ended up not using it at all. Once blended, the combination of sweet potatoes, carrots, and pumpkin added enough richness, so I ended up giving the half&half away to one of my floor mates. This was a mini victory for me, because I ideally did not want to use any cream or extra fat in the recipe, so the fact that I was able to replicate the creaminess with enough starch from the potatoes and butter in the caramelized onions was a success. From start to finish, the soup only took ~40 minutes to make. This may seem like a lot, but it took 40 minutes including cutting, caramelizing onions/vegetables, taking pictures, roasting the pumpkin, taking more pictures, making the croutons, blending the soup, taking even more pictures, etc. When I’m preparing a recipe for the blog, things tend to take significantly more time so this should be a fairly quick recipe in reality. I recommend major multi tasking in this recipe. Season your pumpkin and pop it in the oven before anything else — it takes the most time — and only then start cutting the onions, potatoes, etc. The potatoes and carrots will take some time to cook down in the broth and will lend great flavor to the soup the longer they are simmered, so this can also be done while the pumpkin is cooking. Once the pumpkin is out of the oven, the soup is essentially finished. I swapped out the bread for the pumpkin in the same baking tray to make the croutons, and while the bread was in the oven I simmered the pumpkin and in the broth for a few minutes before blending it all together. 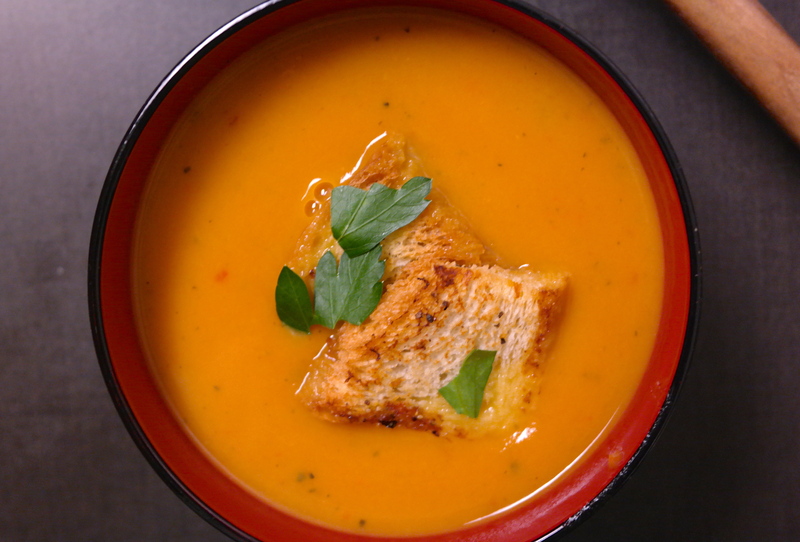 The bread was also a nice touch and transformed the soup into more of a meal. I definitely ate more than the 2 croutons pictured here with the soup. I was constantly adding/dipping the bread into the soup while eating. 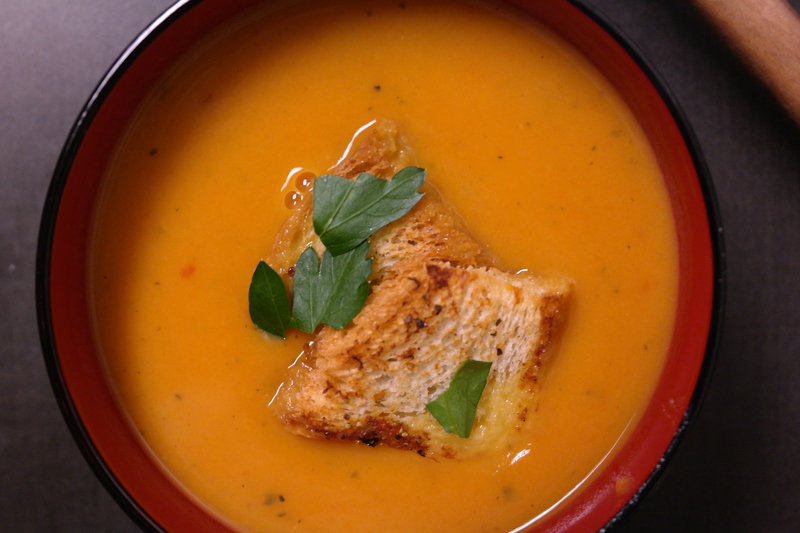 The soup-soaked bottoms and crusty tops of the bread crumbs also added great texture to this smooth soup, so I would recommend adding them. If you want to shy away from the bread, you could add some candied pecans or walnuts atop the soup as well. I meant to make spiced/candied pecans with the soup, but I was in a rush and realized I had forgotten them too late into the process. It would have added an extra ~15 minutes to the recipe, so it is worth it only if you have the time. 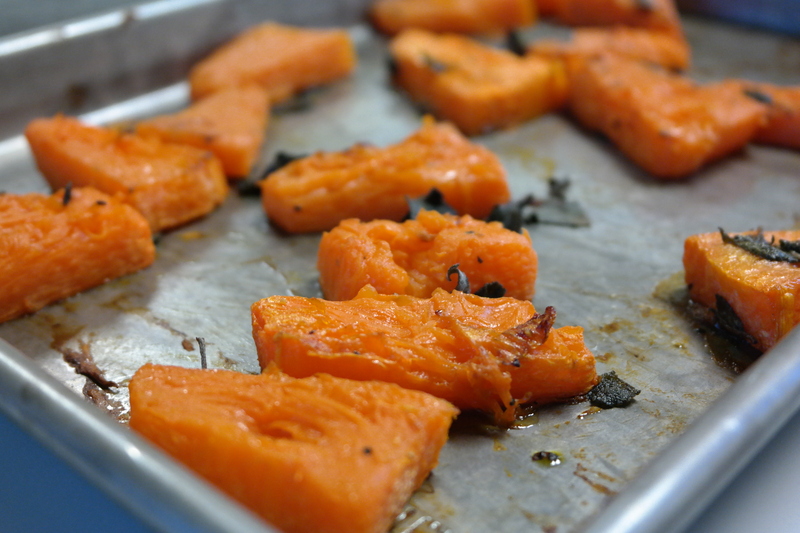 Place chopped pumpkin on a baking tray. Drizzle with olive oil, chopped sage leaves, salt, and pepper. Roast at 375 F for ~20 minutes or until fork tender. Timing will vary based on size of cut pumpkin. 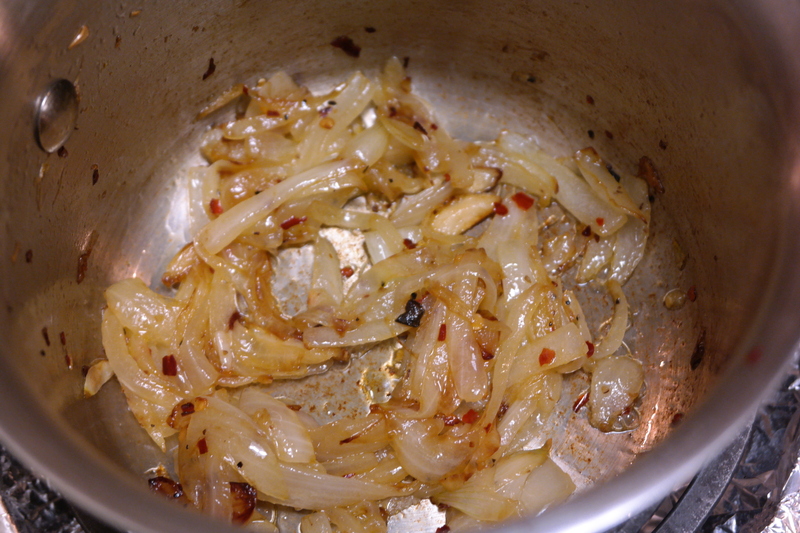 Meanwhile, Caramelize onions in 2Tbs butter. Add a pinch dried rosemary, red pepper flakes, salt, and pepper while caramelizing. Add the garlic, roughly sliced, about half way through the caramelization process. Add chopped carrots and sweet potatoes and cook until slightly softened. Remove pumpkin from the oven and add to the pot as well. Cover with chicken stock and water. 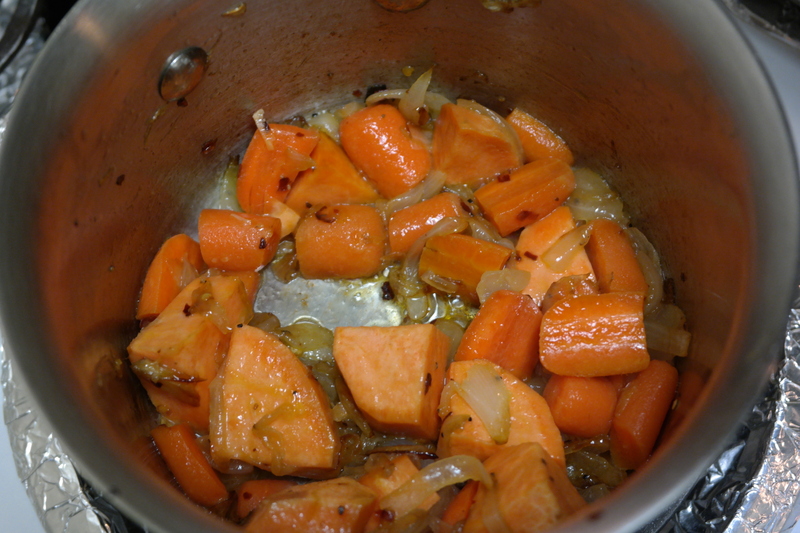 Simmer for 5-10 minutes, until carrots and potatoes are tender. Blend. Add ~1 Tbs butter while blending for extra creaminess.